Hellboy, Microgaming’s comic-themed online video slot, comes with two bonus features, free spins, scatter wins, and a wild multiplier. The top fixed jackpot is worth 10,000 coins. Since Hellboy is based on standard slots rules, players shouldn’t find it difficult to play it. Since it is available in the instant play as well as download modes, players need not download any software to access the game. There are 20 paylines, but players can play as many of them as they like. The game allows a maximum coin bet of 10 per active line and offers a coin value range of $0.01 to $0.25. If players want to bet the maximum of $50.00 per game, they only have to hit the Bet Max option. There is no need to keep hitting the Spin button all the time thanks to the Autoplay feature, which enables players to play the game automatically. Comic book fans are going to love Microgaming’s Hellboy slot as it is based on one of their favorite comic book heroes—Hellboy. The slot gives players the chance to meet super monsters and super heroes while simultaneously winning super prizes. The slot has impressive audio effects and ambience music, greatly enhancing its theme and bringing players back for more. The reels are populated with symbols of Liz Sherman, Hellboy, Johann Krause, Abe Sapien, Prof. Trevor Bruttenholm, and the regular high-value playing card symbols. Hellboy has a wild multiplier symbol in the form of the Hellboy Game Logo. If players use the wild to finish any winning combination, their payouts will be doubled before being credited to their accounts. However, players should note that the Hellboy Game Logo cannot substitute for the scatter symbol. 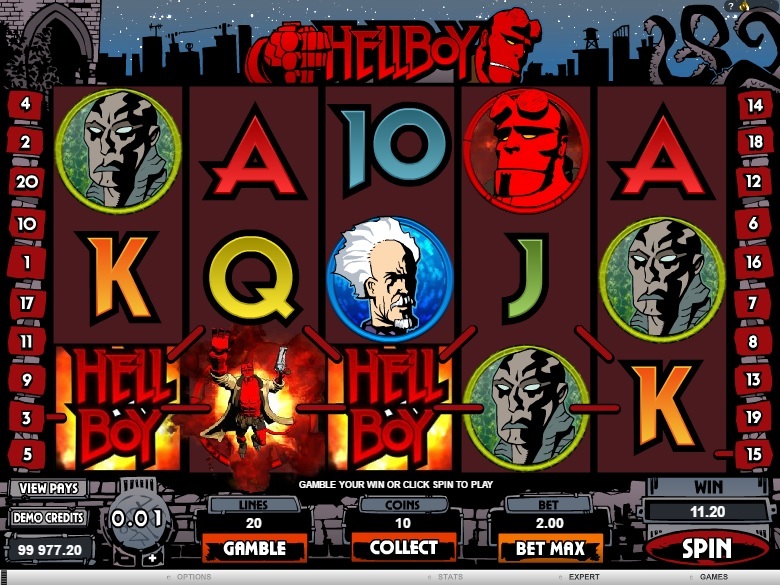 To win the top fixed jackpot of 10,000 coins, players need to land at least five Hellboy Logo symbols along an active payline. The Hand of Doom symbol is the scatter, and players can win generous scatter prizes if they get at least two of them anywhere on their reels. According to the game’s pay table, players can win scatter payouts of x2, x4, x25, and x500 for landing 2, 3, 4, or 5 scatter symbols across the reels. Hellboy comes with a randomly activated Supermode Bonus, which includes 10 free games with three extra wild symbols. The Underworld Bonus gets activated with the appearance of at least three scatter symbols on the reels, giving players the opportunity to win random cash prizes. It is a multi-level game that challenges players to find the Relic of Power and win incredible prizes. Hellboy is worth playing not only for its attractive theme, but also for its interactive multi-level bonus game and a gamble feature that challenges players to either double their winnings or lose them all.